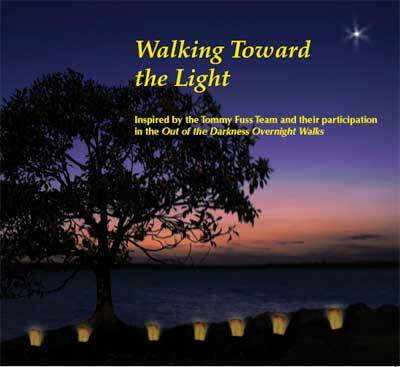 Walking Toward the Light is a song inspired by the Tommy Fuss Team and their participation in the Out of the Darkness Overnight Walks. It is written and performed by Ben Tousley, a local folk singer and song writer. The song is inspirational and empowering, and while it is very personal, it is also universal and will resonate with all those who have lost a loved one to suicide and who work to raise awareness and remove the stigma associated with mental illness. After the 2008 Overnight we began articulating ‘Why We Walk’ and the idea of a song was born. Ben Tousley agreed to work with us and facilitated a focus group to hear our stories. He translated them into a beautiful song, which will be used to inspire and comfort, to educate and empower as we continue our journey. Sponsors of the 2010 Tommy Fuss Team will receive their own copy of this CD as a thank you for their continued support. To sponsor a Tommy Fuss Team member (and receive your copy) go to the 2010 Overnight page. Our journey continues as we walk . . . Leading the way forward . . . into the light. We are deeply greatful for Ben Tousley’s willingness to work with us, his understanding and compassion, and his innate ability to tell our story with words and music that not only inspire and empower, but comfort and provide a sense of peace. Thanks also to all the musicians who participated in this recording. Each with a loved one they won’t see again. I was alone, alone with my grief. . .
We are walking toward the light. Wearing your old coat, could it be you? So deep in my heart—I feel your fire. . . Chorus: (And) we are walking through the darkness. . . Hands held together, reach for the dawn. Till we’re together I’ll walk for you. . . Chorus: (And) we are walking. . .